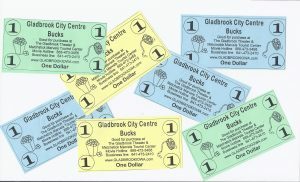 Our gift certificates are in increments of $1.00 called City Centre Bucks. They are good for admission to the movie, concessions, and admission to Matchstick Marvels. We also have copies of the Gladbrook Corn Carnival Cookbook on hand for $15.00. Gladbrook Mustard is available for $4.00. In Matchstick Marvels we have model posters, magnets, trading cards of models #1-5, and kits that you can make your own matchstick creations with.